Boarding Facilities at Ranpura Farm. 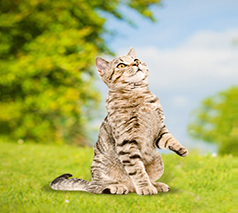 Ideally situated only 15 minutes from Ashford town centre, we are set down a long private drive surrounded by fields providing a peaceful rural environment for your cat. Our cattery currently has 20 Double suites built to a high standard which means two cats from the same home can occupy one unit, we also have adjoining units which can open up to make lots of space for up to four cats. The cattery has its own hygienic kitchen for food preparation and a dedicated washroom for sterilizing equipment. To stop any risk of cross contamination all chalets and equipment are sterilized thoroughly between boarders. We run strict hygiene regimes throughout, thus limiting any possible cross infection to the minimum. Our suites are luxurious, light and cosy with a large play area with shelves for the cats to laze in the sun and enjoy the beautiful garden views. Scratch post choice of litter tray of various designs and colours together with various cat toys is provided. Worried about leaving your cat? Then don't be, all our suites are fitted with IP Web Cams so you can view what your cat is doing from anywhere in the world, via your PC, laptop or mobile phone. Our cattery is secured within a ring fence complete with CCTV and fire alarms. The cattery is immediately adjacent to our family home ensuring a 24 hour presence for the protection and safety of all our guests. We offer a Standard menu and have most foods so that your cat gets the right nutrition it needs. We stock many different foods but may not be able to get supplies of special prescription diets that are provided by vets. We are happy to follow any special instructions such as weighing reducing diet food etc. Web cam access to view your cat from any where in the world. Exclusive – cats only (no dogs). Only cats from the same home occupy one unit. Units cleaned and maintained daily as required. Caring, responsible full/part time staff.